Highlights : Belgium Ardennes forest, Mosel wine valley, historical villages of Bouillon, Etternacht, Durbuy and Monschau, Nurburgring old racetrack, Eifel region, Luxemburg-city, abbey of Orval, Ducale square of Charleville Mézières, American Memorial of Mardasson in Bastogne. First we will stop on the battlefield site of Waterloo and then reach the Belgian Ardennes and the region of the 3 valleys. We enjoy a break in the ducal square of Charleville Mézières before riding the winding roads of the french Ardennes valley which will lead us to the fortress of Bouillon through the valley of the Semois river. We will start this day with the Trappist abbey of Orval before heading to the fortified citadel of Montmédy and we will take advantage of a stop in Bastogne to honor the memory of the soldiers who died during the bloody battle of the Bulge in the Ardennes forest. Then by the hilly roads of Luxembourg and the village of Esch sur sure, we will reach the city of Luxembourg where we will stay. We leave Luxembourg to ride all the most beautiful motorcycle roads in the north of the country including the famous road of the 7 castles and admire one of its jewels: Vianden. 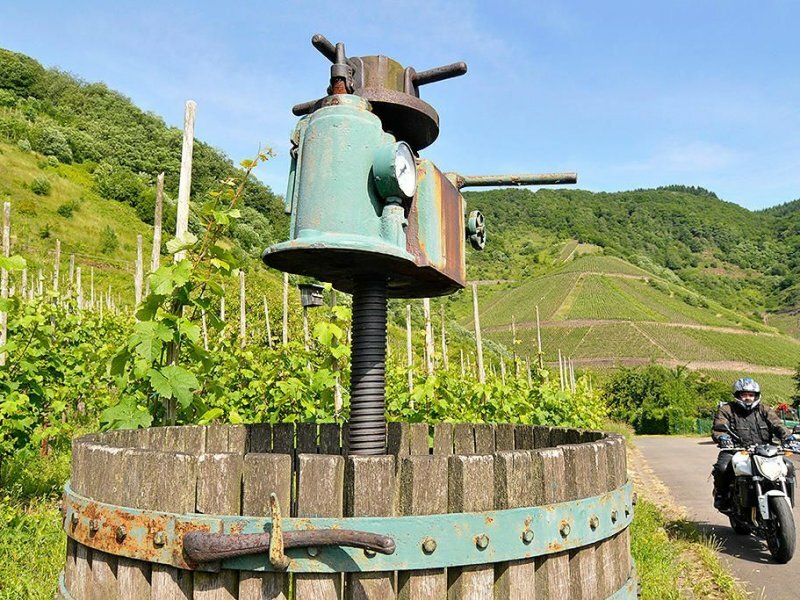 Then we will join the Mosel river valley and its beautiful hillside used for vineyard and reach Bernkastel Kues a typical german village. We 'll follow the valley of the Mosel river and its villages scattered along the river. After a coffee break in Cochem we will leave the valley to enter the Eifel region. Enjoy a 20-kilometer lap ride of the legendary Nurburgring historical circuit before heading to one of the most beautiful German villages, Monschau, through the Eifel National Park. We leave Germany to enter the Netherlands in its highest part. After a stop at Vaalsberg where you can stand on 3 countries at the same time we will head to the village of Valkenburg for lunch break. Then we will return in Belgium in its most hilly part, and after crossing Spa Francorchamps, Malmédy and Stavelot we will reach the ending point of our trip: Durbuy, a village lost in a valley that says to be the smallest city of the world. Ride 5 countries in 5 days, this is the challenge that we offer to accomplish on this motorcycle tour in the heart of Europe, straddling France, Belgium, Germany, Luxembourg and the Netherlands. These border regions too little known by motorcycle travelers offer a variety of landscapes and a cultural richness without commons. Schengen, Maastricht, Brussels, Luxemburg, names that are irreparably linked to the European construction and will be the guiding thread of this unusual motorcycle trip full of surprises. You will cross the Ardennes massif near Bastogne, place of Patton's resistance to the german counter attack, visit the famous Trappist abbeys, ride the valleys of northern Luxemburg dominated by medieval fortresses and follow the tortuous valley of the Mosel until Trier. Adrenaline will be at its height when you will ride on the mythic historical racetrack of the Nurburgring. Finally you will fall under the charm of the historic villages of Monschau and Durbuy which pride oneself on to be the smallest city in the world.